For our first master class we were delighted to welcome our fantastic Armagnac producer Chateau de Laubade. Cognac and Armagnac have a history that is uniquely intertwined with each other, but like the Gallagher brothers, it is Cognac that grabs all the limelight while Armagnac provides the soul. Our presenter for the evening was Denis Lesgourgues who represents the third generation of the Lesgourgues family who now own and run the Chateau. Also for the tasting were our good friends at Paul A Young Chocolates who were on hand to match the Armagnacs with their sumptuous chocolates. 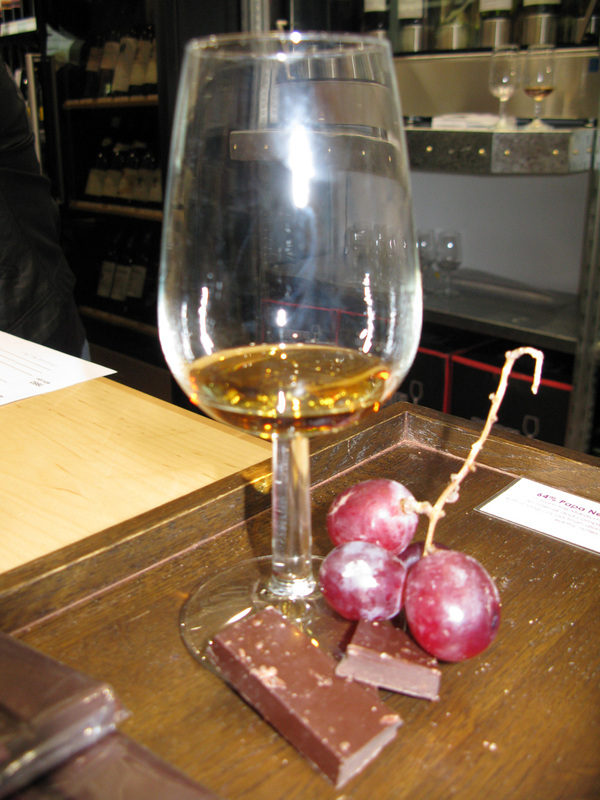 Their expertise had suggested the 64% Papua New Guinea dark chocolate from the Michel Cluizel Maralumi Plantation to match with the Armagnac. First of all though, a little background on the producer. Chateau Labuade is the most awarded Armagnac brand in the world! That’s quite a reputation to live up to! The chateau is a single estate who now own over 260 acres of vineyards and is the largest planter of the exclusive Baco 22A grape that provides Armagnac with that distinct and supple taste. Their Armagnac is single distilled in a unique Alembic still that is native to this region and aged in their own coopered barrels. The chateau has won multiple awards and most recently has retained the title of Distiller of the Year at the World Spirits Award for the third year running! The evening commenced with Denis talking us through the history, the styles produced at the Chateau and philosophy of the house. Denis’s drive for quality is infectious, it soon became apparent that this was no ordinary Armagnac and a buzz was emerging among the fellow tasters at the sight of the first bottle produced to be sampled. Combining the very finest Ugni-Blanc and Folle Blanche grapes, then matured in oak casks from Gascony. On the nose, bold with ripe notes of orange peel, slight hint of spice and a touch of oak. On the palate, an upfront flavour of pears and vanilla, this continues into a smooth and rich honeyed finish. Produced using Ugni-Blanc, Folle Blanche and topped off with Colombard and Baco. Matured for six to twelve years (that’s two years over the legal minimum to give extra smoothness). An elegant nose which opens up into rich plum vanilla notes. On the mouth; supple and delicate flavours of greengage, honey, spice and orange peel. Great to mix in a cocktail or for an after lunch tipple. The matching with the chocolate was sensational, highlighting the honey flavour in the Armagnac superbly! Made exclusively with Ugni Blanc and Colombard, it is aged for 18-25 years and one of the flagships of the Chateau. Elegant aromas of cinnamon, subtle smoke and ripe citric fruit. A voluptuous palette that opens up with flavours of honey, plum and toasted nuts. Simply stunning! Unlike the previous Armangacs, this is not a blend of vintages and made solely from the grapes harvested in 1994. Much like the esteemed XO in taste and appearance, the ’94 opens up into a richer and smoother tipple with riper fruits and mellower oak. Possibly one of the greatest vintages in Armangac, it was the highlight of the tasting! An expressive nose with hints of nuttiness, hot-buttered rum and smoke supported by aromas of plum, vanilla and leather. On the palette, silky smooth flavours of toasted nuts, sweet orange peel and light oak but with a length that just keeps on going! A blend that is aged for a minimum of 32-40 years, this was also is another highlight of the evening! A soft nose with aromas of rich spice and vanilla. On the palette, elegantly weighted flavours of pipe-tobacco, soft green plums and apples with a backing of oak and smooth vanilla. A fantastic finish to a meal! Chateau Laubade is like an exhilarating weekend break to an exotic overseas city, it leaves you with an unforgettable experience that makes you want more! Or alternatively, please visit Matt and the team in store and speak to them directly.